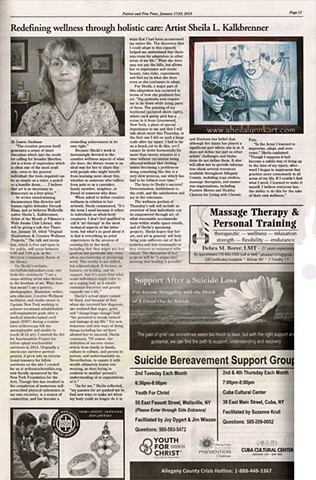 The Cuba Patriot and Free Press, a local paper that publicizes events in Allegany County, published this feature article about my work as an introduction to the Creative Wellness Works exhibit and artist's talk at the Wide Awake Club Library this week. I am always trying to come up with ways to give patrons something that other people don't have access to in the public (read as: "free") domain. I thought it could be interesting to give you the behind the scenes Q & A from the phone/email interview with Laurie Dashnau that she used to inform the article for the paper. 1. How did the gallery talk come about? 2. What would you like readers to know about the gallery talk next Thursday? How will it be similar to or different from other receptions featuring your work? 3. What will be featured, and why? 4. To what extent are your different passions and commitments (e.g., to herbal wellness teas, recycling programs, and the like) part of what you present/address up front and/or address when talking with specific groups/individuals/potential patrons, and why? 5. How would you describe the concept of patronage to those who are unfamiliar with or perhaps even skeptical of it? How is it similar to and different from GoFundMe campaigns and the like? 6. What has recently (however you would define that) been going on in terms of your own work, growth, reading, goals, etc. as an artist, both individually and in community with other artists? 7. What can you highlight (e.g., your participation in Small Business Saturdays and beyond) that is specifically Allegany County focused? 8. What else would you like to share and/or wish I had asked you? We were on a deadline and I responded with whatever popped in my head at the time. These stream-of-consciousness-type responses were quite lengthy. So, they understandably did not end up in their entirety in the article in the paper but, I felt it might be a good behind-the-scenes-read as a pdf for my patrons subscribing at $1 and up.